Elegant European styling in a richer version of today's neutral colors. Thick, cut velve features cream and ash grey in a high-low, impressive damask. Straight forward styling and glamorous trimmings continue the fresh look. The Knightsbridge Bedding Ensemble is hand cut and made to order with exacting standards just as they have been for our interior design clients for 27 years. Knightsbridge Damask Bedding is a limited edition design by Tanna Espy Miller available only while supplies last. Super queen and super king sizing is recommended for pillow top mattresses. Pillows are made with removable poly inserts and finished with zipper/ flap closures for easy care. 2 or 3 Euro Pillows 26x26 2 for Queen ensemble, 3 for King ensemble. 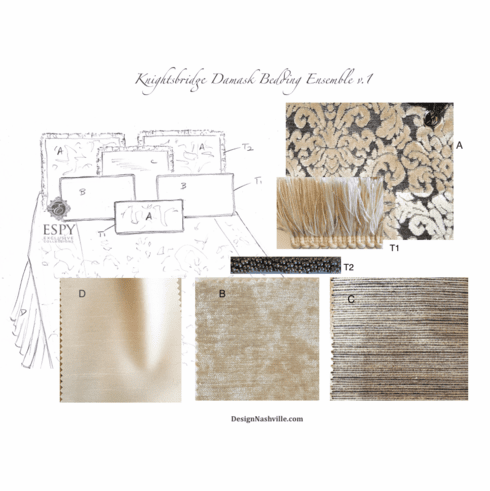 Knightsbridge Damask Velvet Fabric front and back. Deluxe Brush Fringe, vanilla. 1 Duvet cover/ coverlet Knightsbridge Damask Velvet Fabric face, solid or nearly solid light tan or cream back. Shimmery Chenille, vanilla 1/4" fabric covered cording on three sides. The bed covering is made with a zipper/ flap closure near the foot on back. It can be used with or without a down filler. The Knightsbridge Damask Fabric will lie nicely without quilting. 1 Shirred Skirt Pongee Faux Silk in your choice of lengths. Foot quilt, alternative trims, and other coordinates are available upon request. Bedding is made to order in Nashville, TN. Lead time varies with the season of year, difficulty of the work, and number of orders in the work cue. You may want to pay in full online or email us to order with deposit and balance due when the work is nearing completion. We will send a paypal invoice with money request if you choose this option.